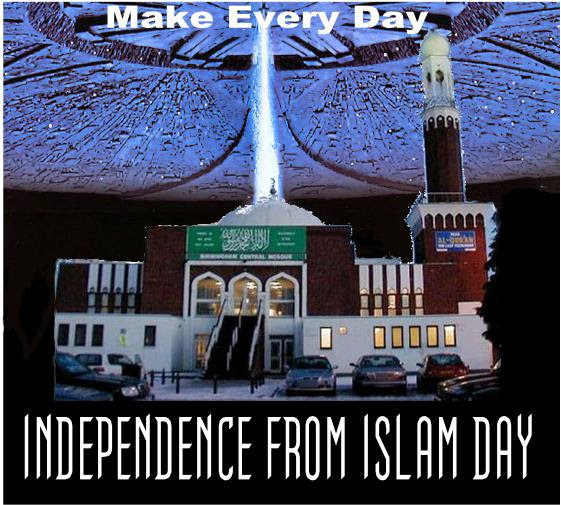 How about declaring every day Independence from Islam Day? Start today. …[A]ll those who consider themselves to be Islamoskeptic should make every day Independence From Islam Day. Speak up about the problems that Islam has brought to places like Rotherham, Tower Hamlets, Rochdale, Waltham Forest, Newham, Redbridge, Bradford, Leeds, Newcastle and so many others. Speak up against Islamic misogyny, Islamic violence, Islamic homophobia and the ongoing brainwashing of our children into believing the lie that ‘Islam is a religion of peace’. Don’t be silenced by the threats of the political Left or their thugs such as the woefully misnamed ‘Unite Against Fascism’. Speak up before you are eternally silenced.